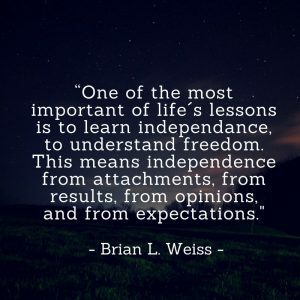 Are you dependent on the “good opinions” of others? Do you feel bad if someone has a poor opinion of you, or says something negative or hurtful to or about you? Are you attached to the outcome of your intentions or your expectations? Will you be disappointed if you fail? Will you think negative thoughts about yourself? Will you be (or are you) dependent on whether those thoughts are positive and encouraging or negative and debilitating? To be successful at anything in your life, you must be emotionally independent of the outcome of your goal. Have you ever been so emotionally drawn to someone and you were paralyzed by the idea of being rejected by him or her? Ever had someone too emotionally clingy and it pushed you away…fully knowing that if that person became emotionally detached you’d be much more attracted to them? Consider how these ideas are connected in the same way. Focus on the results you want, and pursue them with every drop of your passion and vigor…but be emotionally detached from their outcome. Don’t be afraid to cut your losses at a moment’s notice…still in pursuit of your goal, but considering another path. The path that failed you did so for a good reason. There’s nothing wrong with letting fear drive you, but let it drive you to achieve…don’t let it paralyze you from achieving. Don’t allow people to enter into your sphere who don’t speak positive of you. Yes, critical feedback is vital (feedback is the breakfast of champions), and the line between the two can be fine, but negative criticism and critical feedback are distinctly different. Surround yourself with those who genuinely support and respect you for you and YOUR desired outcomes. If that means you must be alone for a while, then so be it. If you surround yourself with people who ‘like’ you but can’t (or won’t) support you in your life objectives, this ensures you will never achieve them. Each one of us is an infinitely powerful creator. Speak to yourself only in empowering language to remember your Infinite power. Endless studies have proven the mind does not know the difference between fiction and reality…it merely accepts what it is told repeatedly. Speak to yourself from the space of the reality you wish to create…repeatedly…your mind will eventually accept and believe it, and then create it. This is the Law of Manifestation. It may take some time for your mind to make the shift. Allow this time, but do not alter your course. After all, you may have spent years (decades?) shaping your mind with false, self-defeating thoughts. And remember that none of it is about you. Oh, the irony of it all. Achieving huge success in business is all about having the power and a gameplan to maintain your power. A.) If you want someone to buy from you, who has the power to determine whether a transaction takes place or not, them or you? B.) If someone wants to buy something from you, NOW who has the power to determine whether a transaction takes place or not? On one side of the power equation you are giving up your power. On the other side you keep your power. In which scenario would you rather have your business? Businesses and people who achieve peak sales levels have discovered ways to use psychological triggers to entice people into wanting to buy from them without ever trying to convince anyone of anything. People who really want something will always figure out a way to obtain it. Discovering how to create this desire in people will cause others to demand what you sell …keeping you on the preferred side of the power equation. If you stay on the ‘convincing’ side of the power equation, your success will only be based on how many doors you can tirelessly knock on per day, working to convince people that they should buy from you. If you master the principles of marketing using psychological triggers to entice people to want to buy from you, your sales will close much easier. While the old ‘sales-based’ approaches of convincing people to buy still work and will likely always produce a certain level of results, if your business uses a sales-based ‘convincing’ approach to get clients and close deals, you will discover that as time moves forward it will become increasingly difficult to grow until you learn the psychological factors that attract buyers to you. You should never make any business decisions based on your opinion or how you FEEL about something. This applies to the name of the business, logos, colors, and product names. EVERY decision in your business should be based only on the perspective of your prospect and solid DATA. The #1 rule in marketing is to test EVERYTHING! The reason why most business decisions fail is because most owners make decisions based on their opinion or how they feel about something. If you always make your business decisions based only on quantifiable data, your business will consistently grow in the direction of what your customers want, you’ll continually attract a larger audience, and you’ll have power and influence over significant groups of people. If you typically make your business decisions based on how you feel (as most inexperienced business owners do), you will frequently struggle to give your customers what they want because your successes will be ‘hit or miss,’ the audience you attract will become stagnant, and you’ll actually tend to push people away from doing business with you, giving you very little influence over people. You should never ‘hope’ for anything. The only road to success (or failure) is driven by definitive decisions (or lack of decisions). Lots of people use the word ‘hope’ in their everyday normal conversation without even realizing how much they are subconsciously and actively undermining their lives. This is a trick word designed to get us to give up our power of decision. If we hope for something, we are not deciding the something. In other words, when we just decide something, there is no doubt, and therefore there is no use for the word hope. When we desire something, yet do not decide it, we “hope” for it. It enters reality on a default code. As long as we hope for anything, we doubt it. Decide instead. To say “hope” out loud is to abandon the sovereignty of the creation of life. Even Tony Robbins teaches to eliminate the word ‘hope’ from your vocabulary as well. Discover ways to elevate your thinking to have actions occur in your life by making decisions for yourself and not allowing situations to simply happen without your conscious interaction. Got Money Troubles? Give More. So many people have been focusing on figuring out ways to make money for so long they’ve forgotten the whole point of money in the first place. That quote represents the very core of every person who is struggling financially, regardless of the economic times. Too many people are focusing on working to make money. Money is simply an exchange of value. By itself, money is just worthless paper or little metal discs with fancy artistic pictures (or numbers in a computer database). If value isn’t exchanged, money isn’t exchanged. This is so fundamental, yet too many people are stuck in their backwards thinking and don’t recognize it. …then, what you argue for you keep, my friend, and you have certainly earned your right to be broke and stand in an unemployment line with nothing to offer but an open palm. Money does not disappear. Money moves around and it does not move until AFTER value is exchanged, not before. Too many people are looking to exchange value after money is exchanged, or believe that money is somehow required to exchange value and, thus, value cannot be exchanged if there is no money. This is quite sad, actually. For anyone who knows how to exchange value with others, money will always be available. Always. Why? Because, again, money is simply a means of exchanging the value, money is not the value itself. On Monday, February 16, 2009, Frank Kern earned almost $4 Million in 8 hours …and on a holiday, no less. How did Frank Kern do this? How was this possible -with “everyone” broke and “nobody has any money?” Does Frank have magic powers? Did he discover another secret money factory and not tell anyone? Maybe he found that ‘money-bandit’ in an Arizona ghost town saloon and slipped a mickey in his Gin to make him talk? Or maybe Frank has secret ties with some bank executives and swindled a few out of their bail-out money (Frank Kern is quite the wordsmith). Seriously. Frank understands how to give away huge value. In fact, Frank Kern gives away TONS of value …with no strings attached… and so does Eben Pagan, along with many other highly successful people most of the world has never heard of. They give their value away first without ever receiving a penny. If these successful business people did not give their value away first, they would not be at their level of success. The bottom line is: If money is just an exchange of value, and money is not coming to you, and value precedes money, then obviously YOU must figure out a way (or a new or better way) to start exchanging value with others, whether that is in your own business venture, at your job, or at a new job that allows you to exchange more value. In other words… If you lack money, you’re not giving enough value to others. A college degree is supposed to help you exchange more value. Unfortunately, many people believe the value is just in the degree itself. They don’t understand the degree itself is worthless. As a quick, final point: Most people and businesses attempt to increase profits by raising prices. Naturally this lowers the monetary buying power over time. Years ago, a candy bar was 79¢ (and even less). Now, they’re about $1.29 for the same candy bar. Adding value to products and services increases monetary buying power. I might sell a training course for $100 and give $100 in value. However, if I also offer a $200 web site at no additional cost, now $100 buys $300 of real product, effectively increasing the monetary buying power. The only way to solve personal economic issues is by giving more value to others -and as much value as possible. If you are giving what is genuinely perceived by others as valuable, money will naturally flow to you. This is the spiritual Law of Reciprocity and is unbreakable. Focus on genuinely benefiting the lives of others and you will achieve a life of wealth beyond your wildest dreams.